The Things I Said I'd Never Do: Menu Monday: Cooking with Engineers. Menu Monday: Cooking with Engineers. On Thursday, while prepping the ingredients for Nachos, I realized we were running low on taco seasoning. I make my own, using this recipe and I usually double the batch so I can always have the seasoning on hand. This time, as I started to gather the ingredients, I realized I didn’t have any ground black pepper. Instead, I only had a large jar of whole peppercorns. We didn’t have a spice grinder that could pulverize plenty of peppercorns in an instant either. I needed 8 teaspoons of black pepper and it was a vital ingredient I could not leave out. So I got out my standard peppermill and started turning. And turning. And turning. After a few minutes my wrist hurt and I only had a teaspoon of pepper. About that time Brett came home from work and I asked him to help in the pepper grinding process. I explained our pepper predicament and handed him the pepper mill. Suddenly, “the look” spread across his face. If you are married to an engineer or a tinkerer, you know “the look”. It causes instant worry. It’s that look of “there’s gotta be a better way to do this”. Sometimes it’s magic and sometimes it means there’s a motorcycle engine in your living room for 24 months. He dashed down to the basement and came back up with his drill. 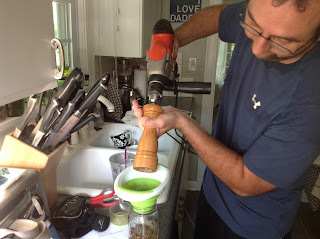 After a few moments of tinkering, the drill was attached to the pepper mill and he was instantly cranking out tablespoon after tablespoon of fresh ground pepper. That pepper also permeated the air causing all kinds of sneezes but our wrists were saved. And the nachos were delicious. We had a slight change of plans with last weeks menu, when on Thursday we made plans to have friends over. I wanted to go fancier than Loaded Eggplant Rounds, so I used this recipe for Baked Eggplant Parmesan and it was delicious. I also put on my fancy pants and made Lavender Cupcakes filled with Lemon Curd and topped with Honey frosting. We had a ton of eggplant parm leftovers so we ate that all weekend and we will be eating the Apple Cider Chicken tonight. Everything we ate during the week was delicious. I especially loved the Jamaican Jerk Pulled Pork recipe. It went great with the homemade salsa. The homemade Jerk Seasoning is insanely spicy. We love spice and had a hard time eating it. I highly suggest halving the amount of crushed red pepper in the recipe. If you don’t like it hot, use even less. We’ve got a busy week and a freezer full of leftovers. I’m doing limited cooking and our grocery list has only 10 items on it! Woohoo! Tuesday: Boys at Chipotle to raise money for school, me at PF Changs for girls night out. Friday-Saturday-Boys on their own. This momma is going on retreat. I’ve been hearing about PF Changs for years and years but have never been to one. Luckily, they post their nutritional information online and I’m surprised that if I skip the rice, I have plenty of healthy options. Anyone have a favorite dish I you recommend?